A dancing duo of black holes. Image: LIGO/Caltech/MIT/Sonoma State (Aurore Simonnet). Physicists are celebrating the detection of a new gravitational wave that was caused by the collision of two black holes around 3 billion light years away from Earth. The wave was detected by the Laser Interferometer Gravitational-Wave Observatory (LIGO), an international collaboration of researchers from all around the globe. It is only the third gravitational wave to have been observed, and the discovery adds to a milestone in the history of physics. "We have opened our ears to the Universe in a waveband in which we have been 100% deaf up to now," says Ulrich Sperhake of the University of Cambridge, who is involved with the LIGO project. Gravitational waves are ripples in the fabric of spacetime. According to Einstein's general theory of relativity, spacetime is not a static stage on which physics unfolds, but a dynamic entity that is warped by massive objects moving within it. 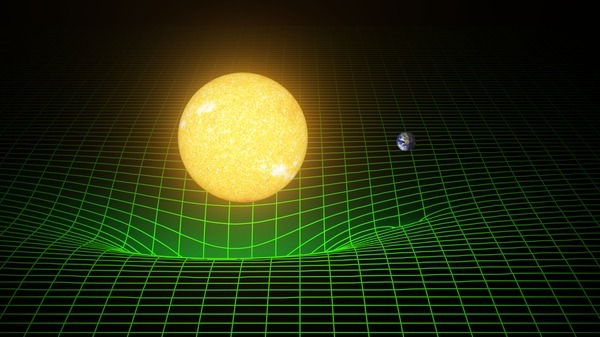 The force of gravity is the result of such distortion of spacetime: the deformation caused by a massive object, such as our Sun, diverts the path of other objects, causing them to orbit the more massive body or hurtle towards it. According to general relativity a collision of two massive objects, such as two black holes, should cause spacetime to ripple just as the water of a pond might ripple as fish cavort within it. Einstein himself suggested that such ripples — gravitational waves — might exist, but it wasn't until 2016 that they were first detected by LIGO. The third detection heralds a whole catalogue of observations which, researchers hope, will unlock important information about black holes and help us solidify our theories. "The fact that we have now seen three gravitational waves in a year gives us hope that, as we improve the detector, we will see hundreds in the next ten years or so," says Chris Moore, also of the University of Cambridge. A massive object warps the fabric of spacetime, visualised in this artist's impression by the green grid. Image: T. Pyle/Caltech/MIT/LIGO Lab. The latest collision involved two black holes of masses 19 and 32 times that of the Sun. Their merger formed a new black hole of 49 solar masses and converted the remaining two solar masses into gravitational wave energy. The resulting signal, detected by LIGO on 4 January 2017, was tiny. It lasted about a tenth of a second and distorted space by only 0.000,000,000,000,000,001 metres. 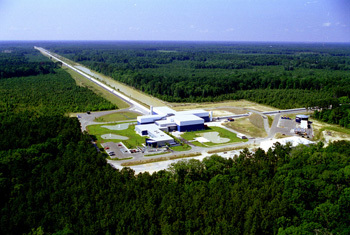 The signal was measured by LIGO's two detectors in Washington and Louisiana. Each detector is L-shaped, with 4km long legs either side. At the end of each leg is a mirror with a laser passing back and forth, which measures the distance between the mirrors and can therefore pick up any distortion caused by a gravitational wave. The data collected by LIGO isn't as straightforward as a photo you might take with a telescope, however. Any signal is hidden within an abundance of noise, and can only be picked out using careful analysis with theoretical insights leading the way. This and future detections of gravitational waves will shed light on the nature of our Universe and on the theories we use to describe it. "One special feature of this particular [observation] is that it's the furthest one we have seen so far," says Michalis Agathos, of the University of Cambridge. "The gravitational waves have travelled longer from their source to us, and this allows us to perform tests on the propagation of gravitational waves that are more precise than what we have done so far." The tests have already confirmed a prediction of general relativity, that all gravitational waves travel at the speed of light, a fact which rules out alternative theories of gravity in which this isn't the case. The LIGO Laboratory operates two detector sites, one near Hanford in eastern Washington, and another near Livingston, Louisiana. This photo shows the Livingston detector site. Gravitational waves will also tell us more about the mysterious objects that cause them: black holes. "There are many things we would like to find out," says Moore. "Are heavy black holes more common than light black holes? 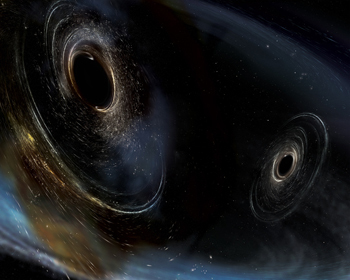 Does the number of black hole mergers change as the Universe gets older?" A catalogue of gravitational wave detections would help us answer these questions. In fact, two of the three detections made so far involve black holes that are more massive than was expected, suggesting the population of massive black holes might be larger than was at first thought. In the future researchers also hope to observe collisions involving neutron stars, to be able to draw conclusions about their nature and abundance. For the moment, however, physicists involved with the LIGO project reflect on their latest success. "It's a bit like winning the FA cup final," says Sperhake. "You've scored a goal, but when you lift the cup you haven't quite digested how significant a moment in time this is going to be regarded as ten or fifteen years from now. It hasn't quite sunk in yet." Simulation of the binary black-hole coalescence detected by LIGO.